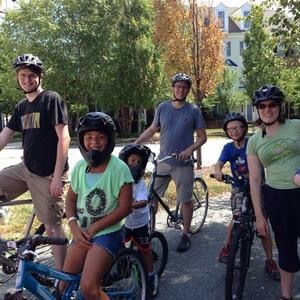 Kidical Mass Rockville | Come ride with us! We had a great ride starting out from the Rockville Swim Center for July, with weather that wasn’t exactly cool, but not too hot at all for summer in the D.C. area! 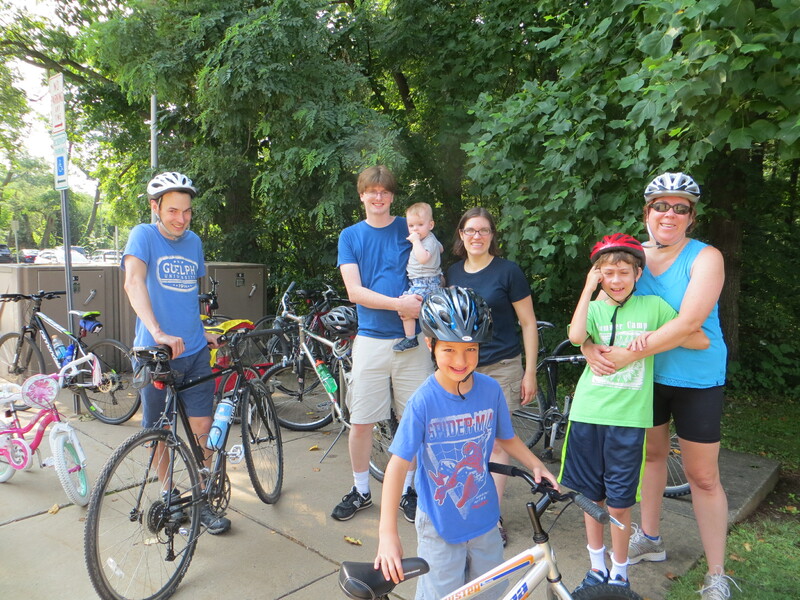 Thirteen parents, kids, and family biking enthusiasts joined us for a ramble around the nearby neighborhood. Our next ride is August 20 starting at the Safeway in King Farm. It will be 2.5 miles with a stop in the middle at the playground in Mattie J. T. Stepanek Park, a park created to celebrate a very special little boy. If you plan to join us, we’d love it if you’d RSVP at the Meetup site. We hope to see you there! The Kidical Mass biking season started with a sunny but small start last month at Thomas Farm Community Center. Nonetheless, the group had some amazing ice cream at Carmen’s Italian Ice. This month, we’ll be meeting Saturday, July 16 at 10 AM at the Rockville Swim and Fitness Center, just outside the indoor pool entrance. We’ll be riding 1.4 miles around the surrounding neighborhood on residential streets and multi-use paths. Check out this interactive Google Map for more details. We’ll be meeting and finishing at the indoor entrance of the Swim Center. Stick around afterwards for popsicles to beat the heat. If you plan on going, we’d love it if you RSVP on our Meetup site so we have an estimated number of people. Hope to see you there! With the warm weather already showing up and spring approaching, the 2016 biking season is near! To celebrate, the Ride Schedule page has been updated with the dates and locations of the 2016 rides. The first ride will be on June 18 at 10 AM. As per tradition, our first ride is going to start at Thomas Farm Community Center and ride to Carmen’s Italian Ice. In other family biking news, the Rockville Bike Hub is supporting Rockville’s TERRIFIC Kids program! The TERRIFIC Kids program is open to all students enrolled in grades 1-5 in Rockville elementary schools. Kids can earn a bicycle by completing six or more responsible acts as described on the Rockville city website. The Bike Hub has partnered with the City to collect and refurbish donated, used bicycles and redistribute them to the children who receive the awards. The Bike Hub is actively searching for kid’s bikes to add to their supply. If you have a children’s bike that is not being used anymore, consider donating it to the Rockville Bike Hub to be part of this program. More information can be found at The Rockville Bike Hub’s website or by emailing rockvillebikehub@gmail.com. If you want to learn more about the ins and outs of family biking, be sure to check out the ABCs of Family Biking this Sunday! Hosted by the Washington Area Bicyclists Association, this event runs from 10 AM – 2 PM in D.C. at the Brookland Arts Plaza (on the Brookline Arts Walk between Monroe and Michigan St. NE, next to the Brookland Metro). The ABCs of Family Biking will offer resources to area parents on family biking and give them the opportunity to test family biking equipment. There will be ASL interpretation available. To RSVP, find the schedule, and learn more, see the WABA Facebook event. Hope to see you there! Sadly, the Kidical Mass ride at Twinbrook for this Saturday is canceled. The ride leader was injured and could not find a back-up. We apologize for the short notice and inconvenience. With the end of the summer, we’re starting to wind down, but Kidical Mass Rockville still has a few more rides! With Kidical Massive and our Twinbrook ride coming up, there’s lots to do. Kidical Massive is a nationwide event on September 19 to help families come together to participate in Kidical Mass rides all on the same day. Unfortunately, Kidical Mass Rockville will not be having our ride in conjunction with Kidical Massive because our parent group, the Rockville Bicycle Advisory Committee, also has a major ride on the same day. We didn’t want to overlap with the Carl Henn Memorial Ride , which remembers one of our city’s great bicycle advocates. However, our sister Kidical Mass Gaithersburg group is doing a Kidical Massive ride that we invite everyone to participate in. Keep an eye on their Facebook page for further details. The following week, on September 26, Kidical Mass Rockville will be meeting at the Twinbrook Community Center at 10 AM. This two mile ride is completely on multi-use paths, although there is a steep hill at the beginning and end (which we can definitely walk if needed!). We will stop at Rockcrest Park in the middle, which has a large playground. RSVP on our Meetup page. We had a great time on our August ride to King Farm, so we hope to see you at one of the September rides! Next Saturday August 15, join us at at 10 AM at the King Farm Village Center (403 Redland Blvd, Rockville, MD, in front of the Price Chopper). The ride is 2.5 miles around the neighborhood on multi-use paths and quiet residential streets. Check out this interactive Google map for more details. We’ll be stopping in the middle at Mattie J. T. Stepanek Park for running around and popsicles! Unfortunately, our Swim Center ride in July didn’t work out to due to torrential rain. All Rockville Bicycle Advisory Committee rides are canceled if it’s raining at the start and we’re especially careful with our little ones participating. We’re hoping the weather holds out for this month’s ride. 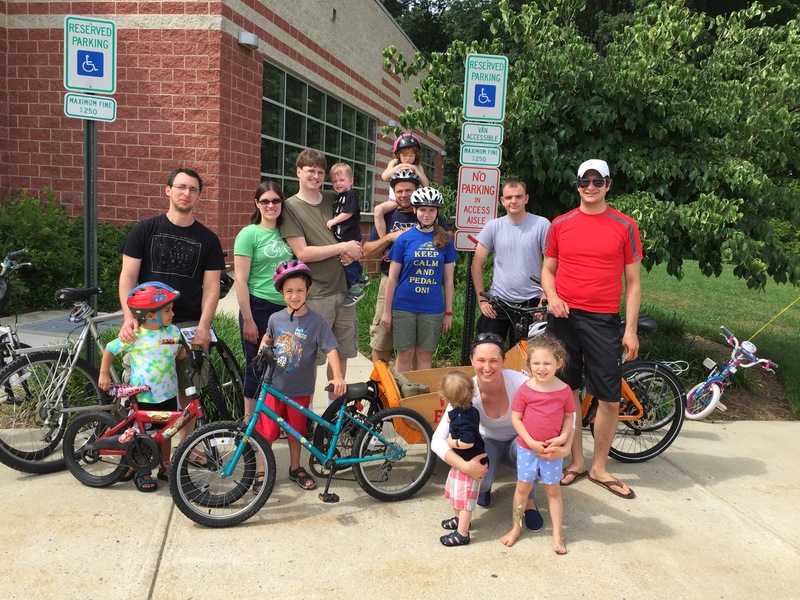 July Kidical Mass Ride this Saturday at Rockville Swim Center! Join us for the July Kidical Mass ride this Saturday at 10 AM at the Rockville Swim and Fitness Center! We’ll be riding 1.4 miles around the surrounding neighborhood on residential streets and multi-use paths. Check out this interactive Google Map for more details. We’ll be meeting and finishing at the indoor entrance of the Swim Center. Stick around afterwards for popsicles to beat the heat. Our Swim Center ride last year! Kidical Mass Rockville kicked off the summer season with a cool, pleasant day for riding. We had a solid turnout of 14 people, with 3 kids on their own bikes and 3 along for the ride. We also had our first family with a bakfiets! Bakfiets, also known as box bikes, are a special kind of cargo bike. One family was trying out Bullitt bikes, which are designed for hauling lots of stuff, including kids, while maintaining speed and maneuverability. Bakfiets are common in the Netherlands and Japan, which have a long tradition of family biking. The family had a great experience with them, saying the center of gravity was solid and the steering relatively easy. As always, eating at Carmen’s Italian Ice was great, even though their soft serve machine was a bit fussy. But as wonderful as this local business is, they don’t have is a bike rack! Fortunately, the City of Rockville is running a grant program to give 10 bike racks away to local businesses. We gave the staff at Carmen’s information about the program, so if you come by on bike, let them know so they understand the demand. Similarly, if there’s any business you think needs a bike rack, please let them know about the program. From Thomas Farm Community Center to Carmen’s and back, the group had a great time together. In fact, one of the kids said he wished it was longer! Our next Kidical Mass ride will meet at the Rockville Swim Center and circle around the surrounding neighborhood. It will be 2 miles, using multi-use paths and residential streets. Learn more about our rides on our ride schedule page, the Rockville Bicycle Advisory Committee’s Meetup group or the RBAC website. We hope you join us to make bicycling in Rockville cuter and even more family-friendly!